The National Audio Engineering Society Convention took place in Los Angeles the last week of September and a number of Belmont students and faculty attended. 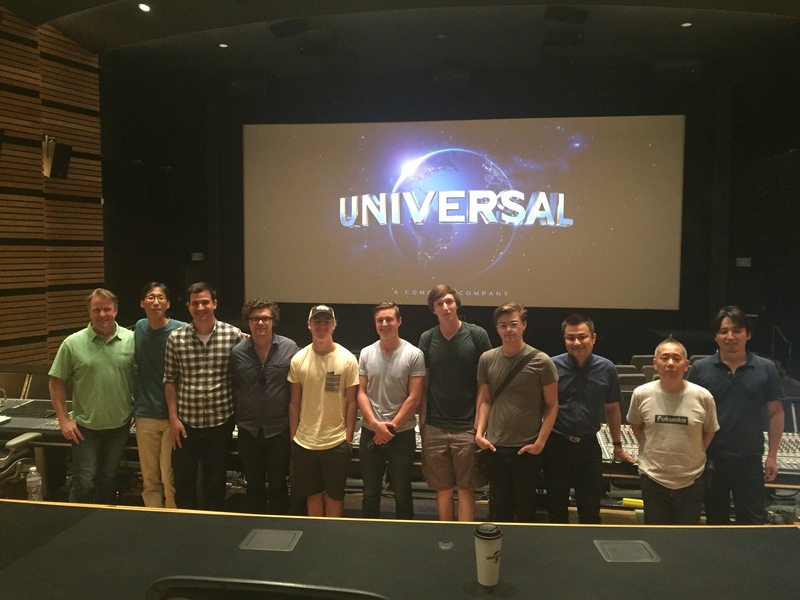 Six audio engineering and technology majors, Dr. Doyuen Ko and a few friends of Belmont visiting from Japan joined Belmont’s Recording and Film Studios Manager Dave Warburton for a tour of the Universal Sound Department. They were given a tour of all the Post Production Sound facilities located on the Universal Backlot and went through Audio Operations, Feature Film and Television Sound Mixing, Sound Editorial and ADR. They met and spoke with a variety of sound mixers, editors, engineers and operations team members working in the Universal Sound Department including a Q&A session and demonstration with Re-Recording Mixer Jon Taylor on the Hitchcock Mixing Stage. Taylor met the tour for nearly an hour going over the challenges and benefits of mixing in the Atmos format and fielding questions from the students. He also demoed a portion of their Oscar nominated mix for “Unbroken” breaking down sound elements before playing the opening scene.